Ford and Intel are exploring a type of car that responds to your face and your gestures. Can they do it? Much attention is paid to talking about autonomous smart cars of the future In terms of how they can help the driver keep a safe distance from the cars near them and maintain safe position in traffic lanes as well as introducing technology for easy parking. 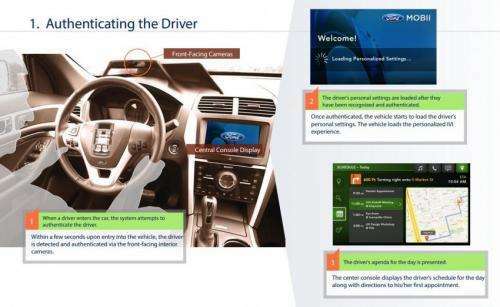 Now Intel and Ford are joining forces to improve the driver experience in a variety of ways where driver and vehicle are quite, to use the ubiquitous phrase, connected. Project Mobii is a joint research effort announced by Intel and the Ford Motor Company. The Intel-Ford undertaking is called Project Mobii, which stands for Mobile Interior Imaging. In a video, Tim Plowman, experience solutions architect, Intel Labs, discussed some questions that reveal what Intel and Ford are thinking about when they refer to interior imaging. Plowman said the questions that have been explored are how can we improve the driving experience if we combine interior cameras, sensor data and driver behavioral patterns? What if we could look into the interior of the car from anywhere in the world using a phone? What if we could check to make sure nobody is in the car who should not be? (A mobile phone app would enable a driver to remotely access the vehicle, allowing for a quick check of belongings left inside or authorizing/declining other drivers to operate the vehicle.) What if we could identify various drivers with face recognition and enable user preferences? What if while driving the car we could make a simple gesture such as pointing to the ceiling and match it with a simple voice command, saying open, for the sunroof to open? The technologies being explored signal new driver-car connections for privacy controls and for easy management of user preferences. The Mobii research going into the project has been a collaboration between Intel ethnographers, anthropologists and engineers alongside Ford research engineers, and incorporates perceptual computing technology. Interior imaging is at the research, not product, stage. "Our goal with the Mobii research is to explore how drivers interact with technology in the car and how we can then make that interaction more intuitive and predictive," said Paul Mascarenas, chief technical officer and vice president, Ford Research and Innovation. Two areas emerge as key to the project: (1) enabling technology in gesture recognition, allowing the vehicle's driver to perform intuitive interactions and (2) enabling technology in facial recognition, for improved safety and parental controls. The scenarios could be like these, according to the press release: Upon entering the vehicle, the driver is authenticated by Project Mobii through a front-facing camera using facial software recognition. Information displayed is specific to that driver, such as calendar, music and contacts. If Project Mobii detects a passenger in the car, a privacy mode can turn information into just a display of navigation. If Project Mobii does not recognize the driver, a photo is sent to the primary vehicle owner's smartphone. The owner can set permissions and specify features that should be enabled or disabled. (The press release said, for example, If the driver is the child of the vehicle owner, restrictions could be automatically set to require safety belt use and limits on speed, audio volume or mobile phone use while driving.) As for gesture recognition software, the release said that "A combination of natural gestures and simple voice commands can simplify such tasks as turning the heat up and down, or opening and closing a sunroof while driving." If car manufacturers wish to improve the driver's experience, the first step they should take is one no manufacturer is going to want to do. Get together with your competitors and make the interface the same across all cars from all manufacturers. All the controls, knobs, buttons, displays, etc.